One of the younger people who appreciates my work, a very young lady called Cora, gave me this picture, which she drew especially for me. Cora mentioned that I am always drawing pictures of other people’s names, so she decided she would do me a birth illustration. Carefully researching what some of my favourite things are (from my leaflet and my blog), Cora drew me a giraffe, an owl, a ladybird, a butterfly and a nice little swarm of bees – a great combination of my favourite things. To add to this, my name is in purple, which is, of course, my very favourite colour. The M is for ‘monkey’ and ‘Michael’ and Cora has replicated some of my illustrations, which I thought was a very nice and flattering and thing to do. 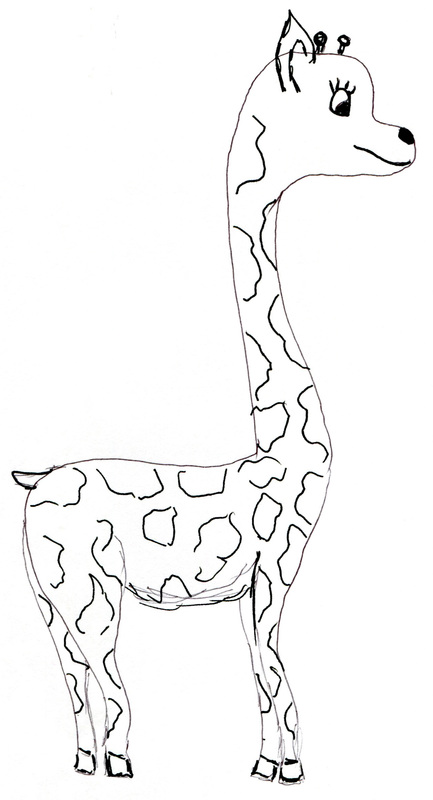 I have very vivid childhood memories of my mother, Carole, sitting with me dangling on her knee, drawing giraffe after giraffe for my amusement. If it wasn’t a giraffe being drawn, it was an elephant. Being a toddler at the time, I couldn’t pronounce these words properly and just made ‘raffs’ and ‘lints’ my simplified version of these words. I find giraffes the most fascinating creatures, with their beautiful patterned skin, long elegant necks and fantastically long eyelashes, not to mention their furry ossicones. I hadn’t done any watercolour paintings for a long time and looked through a large pile of photographs to see if there was anything that inspired me. 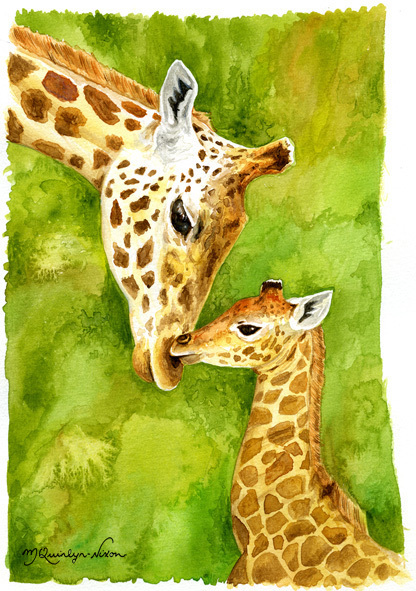 I found this picture of a giraffe mother and child and decided to paint that. Some artists take ages to do a watercolour, but I usually find that I do them fairly quickly. I can spend a large amount of time on one coloured-pencil illustration, but I do not seem to be able to produce them quickly, whereas with watercolours I can see a picture come together much more quickly. 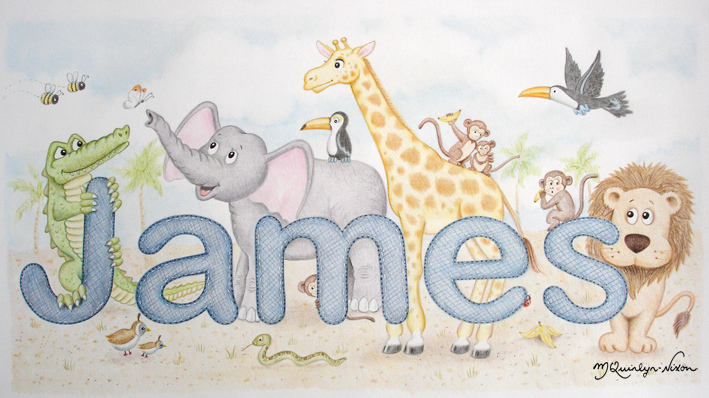 My latest illustration, for a little boy called Elliot, was one that I have enjoyed doing. 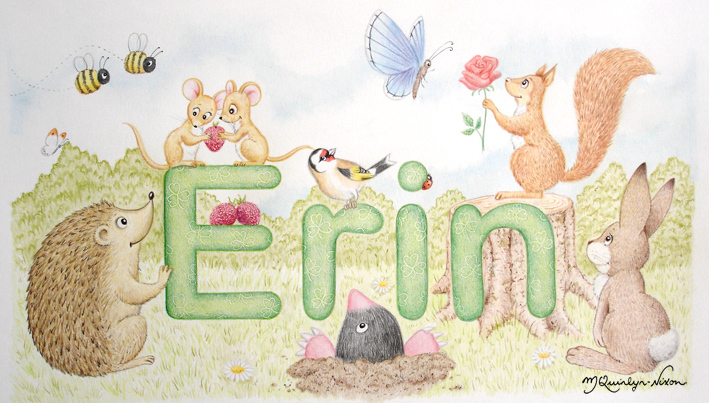 The first letter E was given an elephant, as I find that this is one of the animals most requested by parents (giraffes and hippopotamuses are popular too) and was consequently followed by a menagerie of creatures, including a leopard, llama, insects, owls (I love owls! ), and a tiger. I also added a toucan in the picture, as it has become an image that I have used frequently in my illustrations and on my corporate and promotional literature. I have found that matching the colours of the illustration to the theme of the nursery, is also a nice touch and parents like the fact that you are taking a genuine interest in where the final commission is going to ‘live’ or ‘hang’. Here’s to many more birth illustrations that I will enjoy doing, what will it be next, walruses, pelicans, turtles or flamingos? 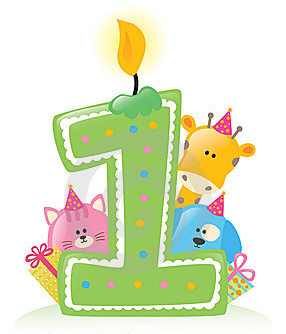 This month – the merry month of May – sees my blog being one-year-old. As most blogging parents, I feel proud of my fledgling blog. I’ve enjoyed writing about my work, my interests and my life and I have enjoyed getting the lovely feedback from my friends – some of which are from my childhood and working life and others from people who have stumbled on to this blog and wanted to leave a comment. To everyone who has left a message on this blog over the last year, thank you for your lovely comments, thoughts and feedback. It’s much appreciated (x).